What’s the deal with your wacky tail-club, Shunosaurus? What’s the deal with most Shunosaur “life restorations” showing spikes on the tail club? I can’t find a picture anywhere of a skeleton with any indication of spikes, and yet almost every fleshed-out illustration of Shunosaurs has spikes on it’s tail. Anybody know what that’s about? 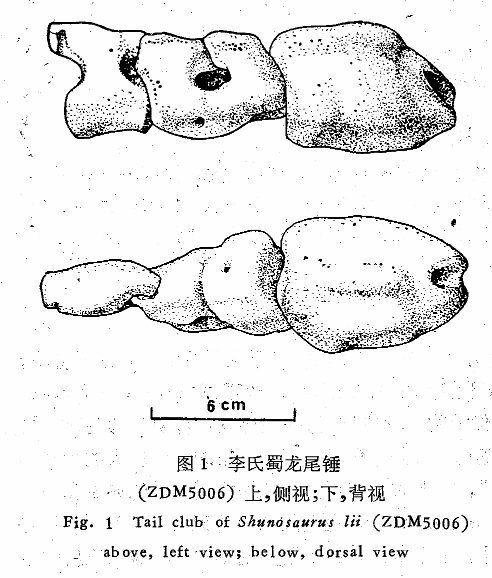 It seems we’ve never actually featured the famous Shunosaurus tail-club here before — an amazing oversight, and one that I’m going to remedy right now, thanks to Dong et al. (1989). This short paper is written in Chinese, so I can’t tell﻿ you anything beyond what’s in the figures, captions and English-language abstract. I can’t help noticing, though, that although the fused clump of enlarged distal caudal vertebrae constitutes a nice club, it’s noticably devoid of spikes. So it remains a mystery why so many restorations show a spiked club. Anyone out know why? One possibility is just sheer coincidence: but it’s asking a lot to believe that of the 150 or so known sauropods, the only three for which tail-clubs are known just happened to live more or less at the same time and in the same place. Another option is some oddity in the environment that strongly encouraged the evolution of tail clubs. Yes, this is wildly hand-wavy, but you can sort of imagine that maybe all the local theropods thought it was cool to hunt sauropods by biting their tails, and the clubs evolved in response to that. Or something. There’s a similar, but even more mystifying, situtation in the late Early Cretaceous Sahara, where the theropod Spinosaurus, the ornithopod Ouranosaurus and arguably even the sauropod Rebbachisaurus all evolved sails. Why then? When there? No-one knows and no-one’s even advanced a hypothesis so far as I know. 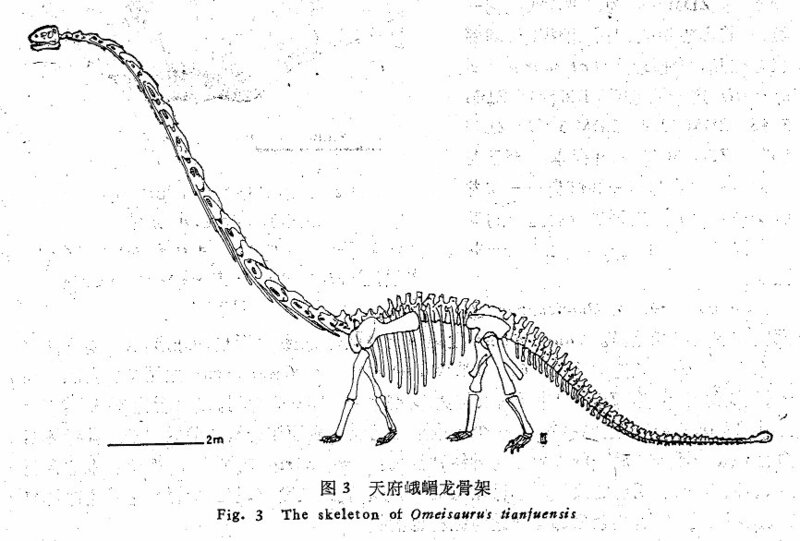 Getting back to Jurassic Chinese sauropod tail-clubs, though, there is a third option: could it possibly be that Shunosaurus, Omeisaurus and Mamenchisaurus all form a clade together after all, as proposed back in the day by Upchurch (1998:fig. 19)? Upchurch’s pioneering (1995, 1998) analyses both recovered a monophyletic “Euhelopodidae” — a clade of Chinese sauropods that included the three genera above plus the early Cretaceous Euhelopus, also from China. The existence of this clade was one of the two major points of disagreement between Upchurch’s and Wilson’s phylogenies (the other being the position of the nemegtosaurids, Nemegtosaurus and Quaesitosaurus, which Upchurch placed basally within Diplodocoidea but Wilson recovered as titanosaurs). Upchurch himself has abandoned the idea of the monophyletic Euhelopodidae, as seen in that 2004 analysis and also in Wilson’s and his joint (2009) reassessment of Euhelopus: everyone now agrees that Euhelopus is a basal somphospondyl, i.e. close to Titanosauria, which is a looong way from the basal position that the other Chinese sauropods hold within Sauropoda.) And so the name Euhelopodidae is no longer used. But could it be that Upchurch was half-right, and that when Euhelopus is removed that the group that was named after it, a clade remains? Now that I’ve defended the status quo [of using unweighted characters in cladistic analysis], there are some things I’d be happy to bend the rules for. If an Omeisaurus pops up with a tail club, then Wilson and Sereno be damned, Omeisaurus and Shunosaurus belong in the same clade. […] So my final word is unweighted characters, please, except for sauropod tail clubs. Finally, I leave you with the skeletal reconstruction of Omeisaurus from Dong et al. 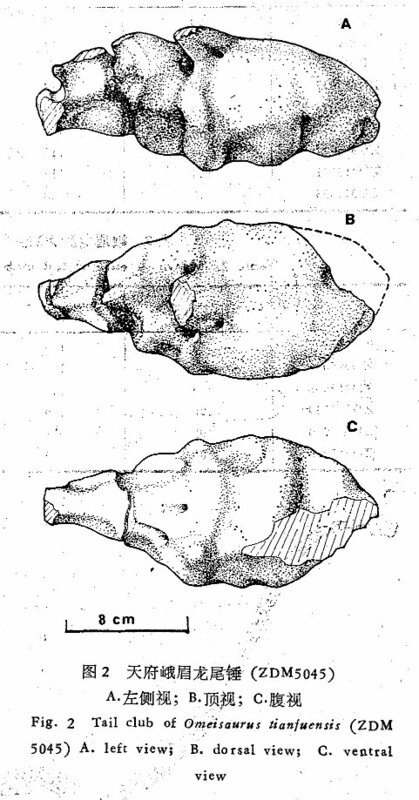 (1989:fig 3). Long-time readers will notice a more than passing resemblance to the reconstruction from He et al. (1988:fig. 63), which you can see in Omeisaurus is Just Plain Wrong. It looks very much as though Dong et al. produced their reconstruction by flipping that of He et al. horizontally and pasting on a tail-club. Well, we can’t hold that against them — I’d have done the same. ﻿Dong Zhiming, Peng Guangzhao and Huang Daxi. 1988. The Discovery of the bony tail club of sauropods. Vertebrata PalAsiatica 27(3):219-224. He Xinlu, Li Kui and Cai Kaiji. 1988. The Middle Jurassic dinosaur fauna from Dashanpu, Zigong, Sichuan, vol. IV: sauropod dinosaurs (2): Omeisaurus tianfuensis. Sichuan Publishing House of Science and Technology, Chengdu, China. 143 pp. + 20 plates. Upchurch, Paul. 1995. The evolutionary history of sauropod dinosaurs. Philosophical Transactions of the Royal Society of London Series B, 349: 365-390. Upchurch, Paul. 1998. The phylogenetic relationships of sauropod dinosaurs. Zoological Journal of the Linnean Society 124: 43-103. Young, Chung-Chien, 1954. On a new sauropod from Yiping, Szechuan, China. Acta Palaeontologica Sinica II(4):355-369. Young, Chung-Chien, and X. Zhao. 1972. [Chinese title. Paper is a description of the type material of Mamenchisaurus hochuanensis]. Institute of Vertebrate Paleontology and Paleoanthropology Monograph Series I, 8:1-30. English translation by W. Downs. I don’t know how convinced I am the tail clubs are genuine. When think of a tail club, I think of ankylosaurs. These clubs look like pathological, ankylosed distal caudals. Maybe they got like that through frequently being accidentally whacked against things, or from often breaking the sound barrier. It also doesn’t make a lot of sense that three random sauropods would evolve tiny little clubs on their tails when nobody else did. Don’t know where the spikes came from in illustrations, but it’s worth noting that glyptodont tail clubs aren’t preserved with spikes either, but their presence is inferred thanks to the big pot-marks along the top and sides of the club. Apparently they don’t have bony cores (the spikes) but are entirely keratinous structures…if they exist. I see no such pot-marks on these sauropod clubs. Or maybe tail clubs are the ancestral trait for eusauropods, lost in various prominent lineages! All right, all right, I was leaving anyway…. Spinophorosaurus is a sauropod more basal than Shunosaurus and Mamenchisaurids: it shows a tail with distal spikes but lacking a club. It is possible that the behaviour “use the tail as a clashing weapon” was ancestral to the eusauropods, and secondarily lost in neosauropods, where the neural arches of the distal half of the tail are strongly reduced. That behaviour forced several lineages among non-neosauropod eusauropods to evolve tail clubs indipendently. Assuming the clubs of Omeisaurus and Mamenchisaurus are correctly referred, I’d agree with Keesey. After all, just how many non-neosauropod eusauropods do we know LACKED a tail club? Man, Inca Mummy Girl was a pretty great episode. Yes, I would say based on a sample of one that Inca Mummy Girls are totally pathological. Huh, I was suggesting that as a joke. But I suppose it does raise the question: How many eusauropod specimens preserve the very end of the caudal series? The tail “clubs” of Omeisaurus tianfuensis and Shunosaurus lii appear to be irregular, reworked bone comprising the last few centra of the caudal series; they appear generally as “inflated” bone. Hennig, E. 1924. Kentrurosaurus aethiopicus: Die Stegosaurierfunde vom Tendaguru, Deutsch-Ostafrika [Kentrurosaurus aethiopicus: A stegosaur from Tendaguru, Dutch West Africa.] Palaeontographica Supplement 7:103–254. I am unfamiliar with the club, so were separate osteoderms described for Shunosaurus lii not seen in the figures above, or were they associated like with Spinophorosaurus nigeriensis and thus assumed to belong to the club “by default”? I would also note that birds also possess skid-like or stiffented distal structures of the tail, as do meiolaniid turtles, without possessing clubs. 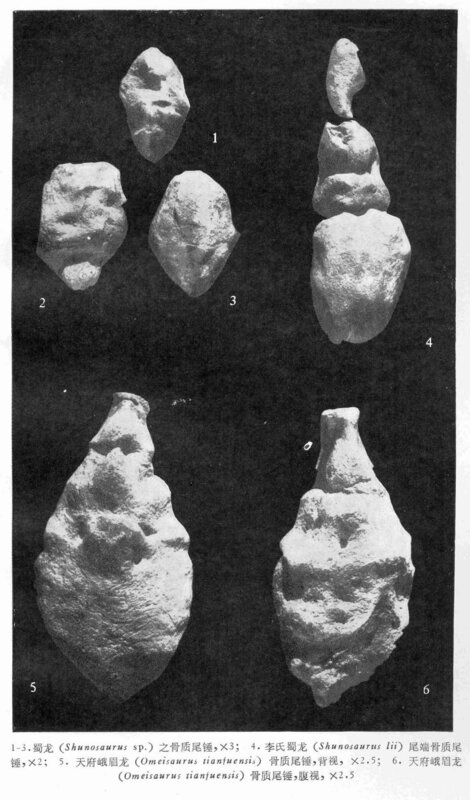 Some meiolaniids, yes, but not all, while possessing osteoderms without making a club. In some oviraptorosaurs, therizinosauroids, and birds, the tail forms a pygostyle while preceding vertebrae produce a rod-like element with skidded chevrons (especially in Caudipteryx zoui and Nomingia mongoliensis, neither of which have a club). In these animals, it may be related to anchoring retrices (although a similar structure is absent in dromaeosaurs like Microraptor zhaoianus while they possess the long, thin rod). It seems the structures in all of these sauropods are inconsistent with a single function or feature, and may be related to different things (and the spikes in Remes’ taxon may not be caudal — we’ve heard of Agustinia ligabuei, right?). Crikey! Thanks for the detailed response Mike! The reason I brought it up is because that picture you guys posted of the Shunosaurus mount in Helsinki has inspired me to do an illustration of Shunosaurus myself and I want to at least try to get it right. I’ll post my rough sketch on my website and maybe throw a link up here (if that’s ok) as soon as I touch it up a bit and scan it. Tough looks aside, it seems like clubs would make more sense as defensive flail weapons than spikes anyway. Clubs are much less likely to get stuck in a tree or the flank of a predator who’s goal was biting said tail off in the first place. The discussion on whether or not it could be an environmental factor influencing Chinese sauropods developing clubs got me wondering if it might have something to do with the density of the forests they lived in… Perhaps species living in more open forests and savannas could’ve spotted predators from farther away and thus might not have needed to use their tails as defensive weapons as regularly as species in denser forests where predators could lurk in ambush. Also, the increased likelihood of whacking trees might also help to explain the clubs if they are indeed pathological. If only one could take a stroll through their environment!! Don’t look away — I have another post in prep that is specifically about the spikes on the Shunosaurus tail club! Oh my! Look away? I wont. That’s exciting because spikes are extra brutal. Also, it would be a bummer if the few nicely-done reconstructions of Shunosaurus were indeed inaccurate with regards to such a key feature. It’s the second picture down in the post. Critical (even the most brutally nit-picky) scientific feedback is quite welcome! Rendering all the scales and ginkgo leaves is going to take a long time so I want to make sure the science behind all the work is as solid as it can be. I’m so confused. I thought there had only been one instance of a Omeisaurus tianfuensis tail club found in the vicinity of the skeleton remains and that at the same site there had been remains of Shunosaurus lii found as well. Wasn’t there a thought that this separated tail club ultimately belonged to a Shunosaurus or has that gone by the wayside? That last sentence no main verb; did you mean to say that all meiolaniids have (caudal) osteoderms, but not all of them have a tail club? Actually I don’t know of any specimens that demonstrate lack of a ‘club’ , but in Meiolania the club is formed not by inflation of the centra, but by fused rings of osteoderms surrounding the distal vertebrae and sutured/fused to the neural arches, forming a conical sheath studded with (in life) horn-covered spikes. The more (but not much more) basal turtle Proganochelys has a similar setup, spiky (but unfused) osteoderms clustered on the distal part of the tail but no expanded vertebrae. These tapering structures would have been quite different mechanically from the heavy stalk-handled clubs of ankylosaurs/glyptodonts/certain sauropods. As for the possibility of a common environmental factor producing shared derived pathologies, I’m reminded of the snakes of the blacksoil/Mitchell-grass plains of northern Australia, where multiple species have a very high rate of tail breakage. This is thought to result from predator attacks that occur while the snakes are foraging or hiding in soil cracks, leaving their tails exposed. Unfortunately, I don’t think the crevice-dwelling-sauropod hypothesis will fly. Several people have noted that many basal Eusauropods seem to have clubby-swellings on the distal tail that may or may not be symmetrical (and may or may not have spikes). Well let’s be honest…if you beat your largely muscle-less tail against something hard, like theropod bodies, or competitors for mates, or both…what happens to your vertebrae after a while? I’d arm-wave that the basal Eusauropod condition was to hit stuff a lot with the end of the tail, and so several taxa show adaptations (possibly parallel in some cases) while others may simply exhibit the painful results of doing so without adaptations for teh behavior (these conditions needn’t be mutually exclusive either). Perhaps adults get large enough that it’s simply not done as often? Different ways to compete for mates? Diplodocid whiplashes preclude the behavior (or are a synapomorphic change to how it is done) and somphospondyl’s whack things with their feet (or just a more meaty…and heavier…part of their tails)?